In response to an age-old thought experiment resurrected today by the New York Times Magazine, “Baby Hitler” is trending on Twitter. It is officially Friday. 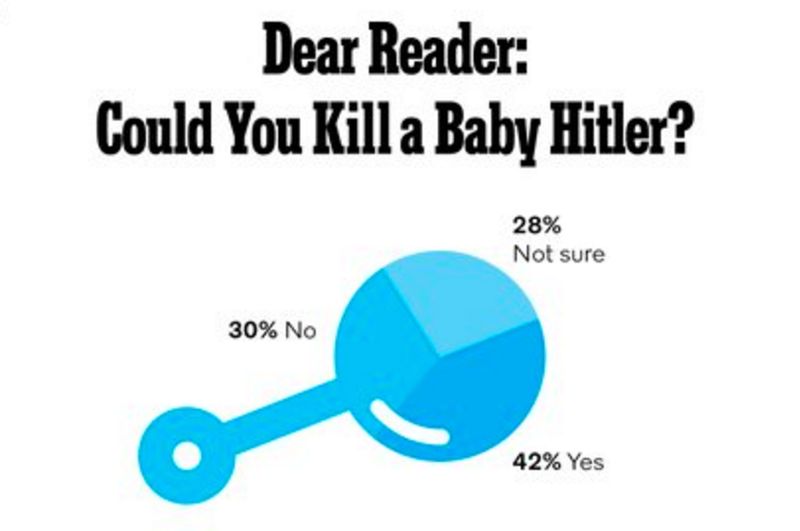 For some reason, the Times magazine decided to poll its readers on a pretty old, pretty meaningless question: if you could travel back in time and encounter baby Hitler, knowing what you know about the monster he grew up to be, could you snuff him in the cradle? It looks like a good 42% of respondents are confident they could do the deed. It’s like none of these people have ever seen a movie about time travel, and considered the ramifications that so drastic an action could ricochet and cause even greater disaster. And why stop with one baby dictator? We could go through time and murder all kinds of babies that grow up to be evil, when you think about it. Thinking about it reveals how stupid and frankly grotesque this question is, and the responsive social internet seems to agree. They’re having a field day with Baby Hitler. Here are a few of our favorite tweets. Jump in with your best baby Hitler bon mot while there’s still time. Friday afternoon has made everyone a little punchy.